Carabiners are one of the most important tools for climbing. Many people fail to appreciate the technology involved in carabiner manufacture. They save climbers' lives every day and have been a part of the climbing experience for nearly 100 years. If you enjoy rock climbing, you need quality carabiners that will provide reliable support and protection. Here is what you should know about carabiners to help you select the best carabiners for your next climb. 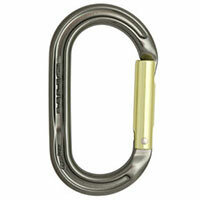 Gate: This is the part of the carabiner that opens and closes. Spine: The spine is the longer side of the carabiner that sits opposite of the gate. 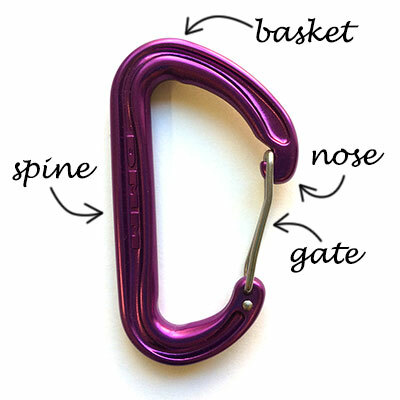 Nose: The nose of the carabiner is the part to which the gate snaps closed. Basket: The basket is the more prominent bend in the carabiner shape, where the rope or the gear will sit when rope or gear is clipped to the carabiner. What Types of Carabiners Are Available? 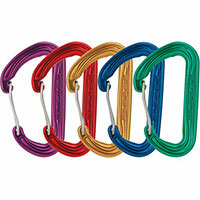 Carabiners are generally made from two materials: aluminium or steel. 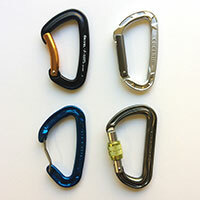 Aluminium carabiners are preferred by trad and sport climbers due to their lightness. Steel carabiners are more durable and are used by commercial and school groups or by climbers for rigging where weight is not an issue. 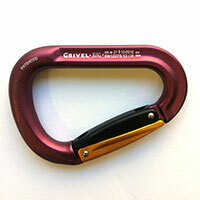 The first carabiners produced were of an oval shape. This shape allows the best possibilities for clipping multiple pieces of gear into the carabiner as the symmetric shape means all items are distributed evenly. This makes oval carabiners like the DMM Ultra O Straight Gate Carabiner a good choice for racking a selection of nuts. Ovals are also superior for use with pulleys as it allows them to run freely. D-shaped carabiners like the DMM Phantom Carabiner and Wild Country Helium Carabiner offer a high strength-to-weight ratio because the load on the carabiner is offset close to the spine. They are a very popular shape with climbers. 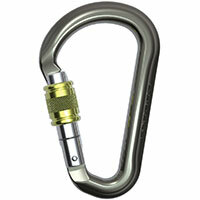 HMS or pear-shaped carabiners are designed for use with belay and rappel devices. Smaller HMS carabiners like the DMM Sentinel Carabiner work well in anchor setups, whereas bigger options like the DMM Boa HMS Screwgate Carabiner and DMM Belay Master 2 provide smoother belaying action and less likelihood of cross-loading and jamming of the carabiner. Every carabiner comes with a strength rating, which is permanently marked on the carabiner. It consists of three figures which are rated in kilonewtons (kN). The first number refers to the strength rating along the carabiner's major axis. The other numbers refer to the carabiner's strength when cross-loaded and if the gate is open. Carabiners are also available with several gate options. 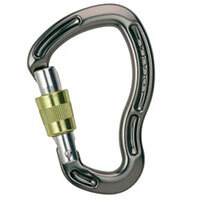 Carabiners used for quickdraws, bolts and protection. Designed for smoother rope clipping. Bent-gates should only be used on the rope end of the quickdraw or runner, never on protection. If you want a carabiner that can assist with belaying or protect you from accidental gate-openings, opt for a locking carabiner, of which the most common type is the screwgate, for example the DMM Shadow Screwgate Carabiner (pictured). Other kinds of locking carabiners include the Edelrid HMS Strike Twist Carabiner, Edelrid HMS Strike Slider FG, Grivel K6G Mega Twin Gate and Black Diamond Rocklock Magnetron. It is important to note that locking carabiners are no stronger than the non-locking carabiners, but all carabiners drop in strength dramatically if the gate comes open, which means that locking carabiners offer a greater level of security by ensuring the gate remains shut at all times. Locking carabiners are always used when belaying and in top rope anchors. Bogong Equipment offers a full selection of quality carabiners including screwgate carabiners, wire gates, bent gates, solid gates, twist-lock, steel and alloy carabiners. We also offer carabiners in both locking and non-locking options and many shapes including D-shape, oval shape and pear shape. We stock a range of brands, including DMM, Edelrid, Faders, Grivel, Kong carabiners, Rock Empire, Stubai carabiners, Wild Country carabiners and Black Diamond carabiners. Before you use carabiners, make sure that you learn the proper techniques for use from a climbing instructor. Not sure which clip carabiner or other rock climbing gear you need? We’re here to help. Give us a call on 03 9600 0599 if you need assistance with selecting carabiners. Remember that for safety reasons, you can't return climbing equipment to our store once it is purchased. (This doesn’t affect your right to exchange or refund for faulty goods).